Friday afternoon I was standing at my kitchen sink thinking, Ahh, what am I going to possibly blog about this week? Then I turned around and saw this. 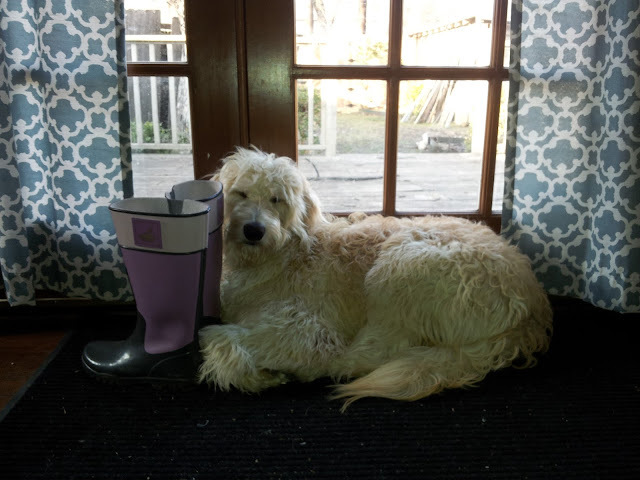 The Milt dog nestled up to my rain boots, lately garden boots, made this blogger's day! When living in New York City, it was imperative that I have a good set of boots due to all the blocks you walk and the inevitable mists, showers, and downpours. This was actually my third set of rain boots in as many years because they would keep getting irritating holes in them. Believe me, when you have to walk two avenues over and five blocks down to reach a subway stop, you will not tolerate any sort of leakage in your footwear. Now, whenever there is an indication of rain, I just wear these boots all day long. Despite now driving everywhere, I still like to reminisce about the good old days. Spring has almost sprung everyone! Happy March. He looks like he's waiting for the rain to come so that you and he can play in the puddles!